The New Testament is filled with many different subjects. 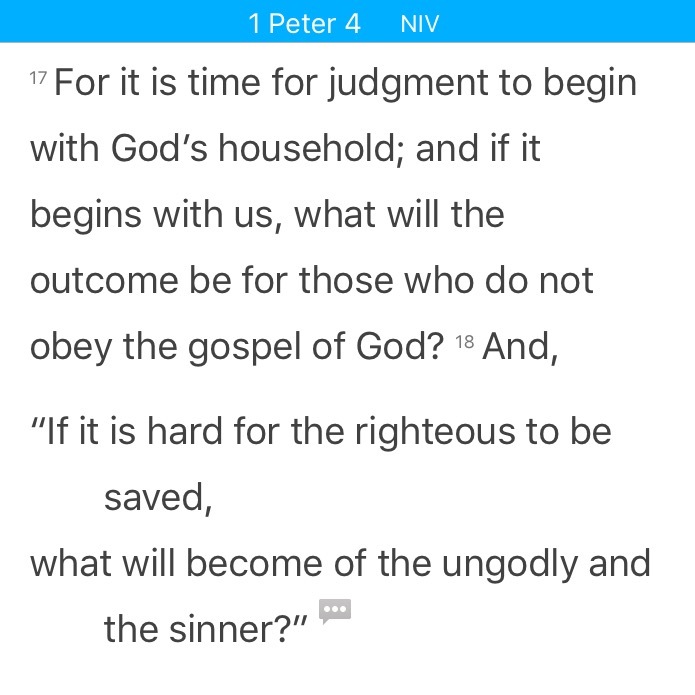 For the last couple months our church has been going through the book of 1 Peter. It seems that each time I preach I get the opportunity to preach on suffering. Peter hits on this subject a few times in the letter. Peter continues writing about suffering and switches to talking about God’s final judgment (read 1 Peter 4:17-18). The “For” in verse 17 reaches back to the idea of Christians suffering in verse 16. Peter wants to keep the same train of thought but share more on the subject. Some Christians have a problem with the idea that judgment will begin with God’s household. Peter could have written about those who have rejected the message of Christ, but he chose to begin with those who have accepted the truth of Jesus. This line of writing is similar to what the prophets wrote in the Old Testament. Ezekiel, Zechariah, Amos and Malachi all have similar statements in their prophetic books. And Jeremiah, Zechariah and Malachi each write about the fiery ordeal and God’s judgment beginning with His people. Peter seems to have this perspective in mind as he attempts to encourage the believers in Asia Minor. When we look at what the Old Testament prophets wrote and what Peter has written, we see that the grammar is the same but the theology is different. Let me explain. In the Old Testament, the judgment talked about was an annihilation of God’s unfaithful people. The people in the Old Testament were living lives of sin and God’s judgment was to come because of that. But what Peter is writing about is a purification of God’s people, a purification that will prepare them for the final judgment. The difficulties that God’s people encounter are designed to purify and refine believers so they will be ready to receive their final reward. Then Peter quotes directly from Proverbs 3:34. He uses this to restate what he has just written. What does it mean when Peter writes: “It is hard for the righteous to be saved?” It is not hard for God to save people; that is not what he is writing. You can also translate hard to mean difficult. This is a continuation on the thought of suffering. The believer will endure suffering in this life. That suffering will be difficult. The suffering may be difficult now, but it will be worthwhile when Christ returns. I love what C.S. Lewis writes on the topic of suffering: “Try to exclude the possibility of suffering which the order of nature and the existence of free-wills involve, and you find that you have excluded life itself.” There will be suffering but suffering, for a believer refines you. These verses can also prompt a person to think more about personal evangelism. Have you thought about that question before? What will happen to the ungodly? Let that question bother you this week. Allow this question to take up space in your life as you encounter others this week. When you see people at work, the store, the coffee shop, your lunch spot or in your neighborhood think about what will happen to them in the end. Instead of only being concerned with yourself, think about those around you and their final outcome. 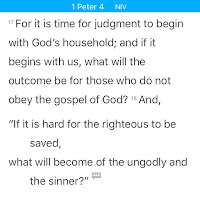 Peter never gives an answer to his question in verses 17 and 18. But the Bible tells us elsewhere what the outcome of the ungodly and the sinner will be. Their outcome will be eternal separation from Christ (Matthew 25:41). The Bible tells us that those who reject Christ as their Savior will experience weeping and gnashing of their teeth (Matthew 25:30). Allow these words from Peter to prompt you to share the love of Christ with others. If you’ve placed your trust in Christ, don’t keep that to yourself. Others need to hear the truth. You have people in your life who need the joy of Jesus. We can conclude from these verses that it’s better to suffer a little now for Christ than to be separated from Him for the rest of our lives.